As Hillary Clinton once said, "It takes a village." That is certainly the case with Salt Lake City's most glamorous and most expensive (to build) new restaurant: Current Fish and Oyster. The illustrious list of collaborators behind Current reads like a Who's Who of the Utah dining scene. At the helm are the dynamic duo of Mikel Trapp (a father of triplets whose Trio Restaurant Group includes Cafe Trio, both in Salt Lake City and Cottonwood Heights, Fresco Italian Cafe and Luna Blanca Taqueria, not to mention Trapp's previous work as chef at Stein Eriksen Lodge and Metropolitan) and Joel LaSalle (whose LaSalle Restaurant Group's roster includes Caffe Niche, Faustina, Kyoto and Oasis Cafe). That would be a strong-enough start. But then, add to the Current team executive chef Logen Crew (formerly of Log Haven and Fresco), bar general manager Amy Eldredge (Philadelphia's Ranstead Room, The Dandelion and SLC's Bar X), manager Hillary Merrill (Faustina), director of operations Kelly Tomlinson (Baci Trattoria, Trio Restaurant Group and Portland's Pok Pok), beverage director James (Jimmy) Santangelo (owner of the Wine Academy of Utah), pastry chef Alexa Norlin, Trio Group executive chef Jennifer West and others, and you can see that Current has launched with an all-star food & drink team. As I begin to peruse the menu and drink list, my eyes dart around this modern space that was previously home to not-so-modern Salt Lake Antiques—a building that dates back to 1906. Layer after layer of floors, walls and ceilings were stripped back to their original state, and the shell was refurbished by realtor/restaurateur David Harries, who then sold it to LaSalle. The entire place now looks like a million bucks, which is a bit less than it cost LaSalle and Trapp to build Current. According to Joel LaSalle, "It would have been a lot cheaper just to tear the place down and start from scratch." But kudos to Harries, LaSalle and Trapp for preserving a venerable historic space. LaSalle—along with architects Louis Ulrich and Kim Webb of Luna Design Group and furniture designer Suzette Eaton—has created an absolutely stunning eatery. So, how does the food and drink stack up to the heavy-hitters at the helm and the eye-popping décor and design? Pretty damned well, actually. 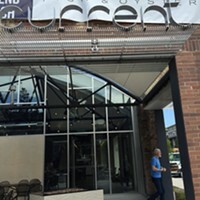 Current has been packed ever since opening—and, even in its earliest stages, I was very impressed with the service and the food. I didn't rush to write about Current before the paint was barely dry—I prefer to wait and give restaurants a few weeks to settle in. However, from Day 1 to the present, I've been bowled over by the cuisine, the service and the ambience. It's a no-brainer to begin with an order of fresh East (or West) Coast oysters ($2.75 each/$16 half-dozen), which come with a choice of cucumber mignonette, spicy ponzu or cocktail sauce. I got greedy and asked for all three, which our server was happy to deliver. The oysters are impeccably fresh and delicious. From there, we split a "hot plate" order of grilled lobster tail ($22). It was wonderful: tender, skewered strips of lobster tail, grilled and served with edamame, julienned daikon, spicy Fresno chile rings and a silky miso-citrus sauce. It's a divine dish with a fair amount of chile kick to it. On the "cold plate" side of the menu, you'll want to get your lips around the Alaskan King crab lettuce wraps ($18) with cocktail sauce and citrus-basil aioli. I'd make a light meal of those wraps and Current's stupendous french fries ($6). They are, hands-down, the best french fries I've eaten in a Utah restaurant, and I've had some awfully good ones elsewhere. They are hand-cut, soaked in water, and fried twice: once at 300 degrees, and then a second dip into hot oil at 375 degrees. The "side order" of fries is huge; it could easily be shared among three or four hungry people. The wine, beer and cocktail list isn't the biggest in town, but it's well-conceived. Highlights include wines "on tap" such as Tangent Winery Sauvignon Blanc and Mondavi-made "CFO Signature Series" Cabernet and Chardonnay from Napa, priced at $14 per 10-ounce carafe or $36 per 22-ounce carafe. There's also a focused selection of white and red wines by the bottle and glass, as well as oyster shooters, bubbly, spirits, beers & ciders, cocktails and more. One of my favorite dishes at Current was one of my wife's least favorite: branzino ($30). Buyers beware: This one takes a little work. 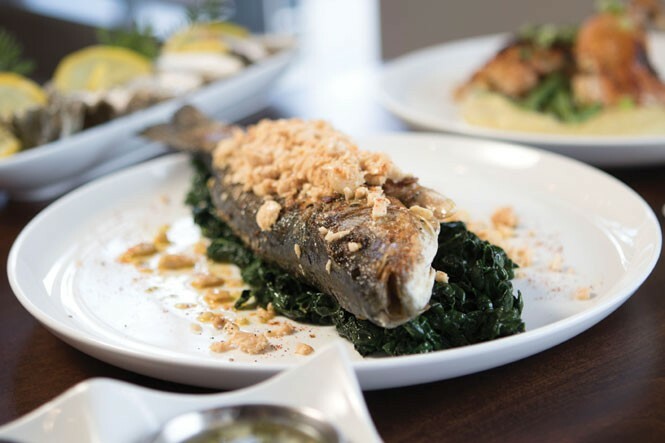 It's a whole branzino fish, cooked to a beautifully crisp exterior and flaky, tender interior in sea salt and extra-virgin olive oil. The trick is that it comes to the table whole—head and tail intact—and requires deconstruction on the part of the customer. That's fine with me; I wish more restaurants served whole fish, but it's not for everybody. An easier dish to eat—and one equally as delicious as the branzino—is the oven-roasted chicken ($19). This is a gorgeous piece of bone-in, organic Mary's chicken atop a bed of potato purée with green beans and luscious pan gravy, sprinkled with fresh rosemary. For dessert, I recommend trying the homemade sorbets and gelatos. Or, for a real contemporary kick, order Chef Norlin's creative Yuzu Posset ($7). It's a posset bowl (think pudding) with rosemary gelée, olive-oil "powder" and a luscious burnt-citrus tuile. Wow. Somehow, Current has managed to find the sweet spot: It's au courant without being especially hip or trendy. Unless, that is, top-quality service, food, drink and ambience are becoming a trend.